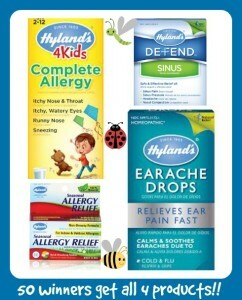 Hylands Allergy Prize Pack Giveaway | A Savings WOW! GIVEAWAY: Hyland’s Allergy Prize Pack (Ends 4/25/14) – 50 Winners! In our household, we enjoy the change in weather, but don’t enjoy how it affects some our allergies. Do you or someone in your family suffer from allergies? Spring has finally arrived and those seasonal allergies are affecting so many people! Hyland’s can help! They make products for the whole family! Hyland’s is celebrating over a century-long commitment to making safe and natural homeopathic medicines. During all these years, they’ve never lost touch with the reasons why their founders started this company – beginning with the pharmacist and visionary George Hyland back in 1903. They have always been driven by the simple scientific proof of how the body can call upon its own natural defenses to heal and restore balance. This is the basis of homeopathic medicine. So even during times when cultural and political factors have pushed homeopathic medicine from the mainstream, Hyland’s has solidly stood its ground with integrity and wisdom. Starting Monday, 4/21/14, you can enter to win one of the Hyland’s Allergy prize packs and you can enter daily! There will be 10 winners picked each day. This great giveaway ends 4/25/14 at 11:59p EST. Be sure to enter daily for more chances to win! Click HERE or on the banner above to enter to win! Disclosure: This giveaway is sponsored by Mom Does Reviews and Hyland’s. We are not responsible for prize shipment or fulfillment. Please see our disclosure policy for more information.